For the next few months I’m excited to be working with PC® Organics to share some fun and informative content on the topic of feeding your baby. I’ve been a fan of this brand since Ari started solids and love that it offers organic options at comparable prices to many non- organic products. 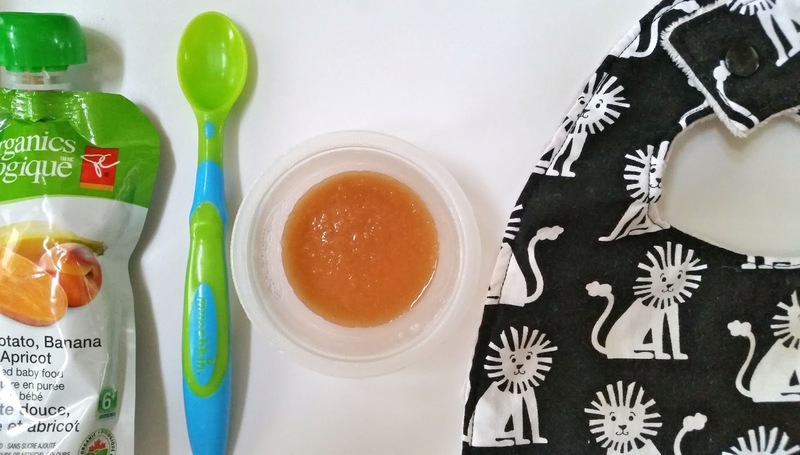 With Liam just starting solids I thought it would be a good time to share my first post in this series with some tips on starting solids with your little one. It can be a little exciting and emotional- where did the time go??? Suddenly that little baby of yours is marking an important milestone and trying solids for the first time. But as with everything that comes with our little munchkins, there is a lot of conflicting information. To help sort through all of this info, this series of posts will offer up nutritional advice for your little one to help you figure out good foods to try and meet their nutritional needs. There will also be some fun surprises along the way (when aren’t there surprises as a parent 😉 ), so stay tuned! right foot. Bon appeitit little one! Your baby learns to eat by watching you. 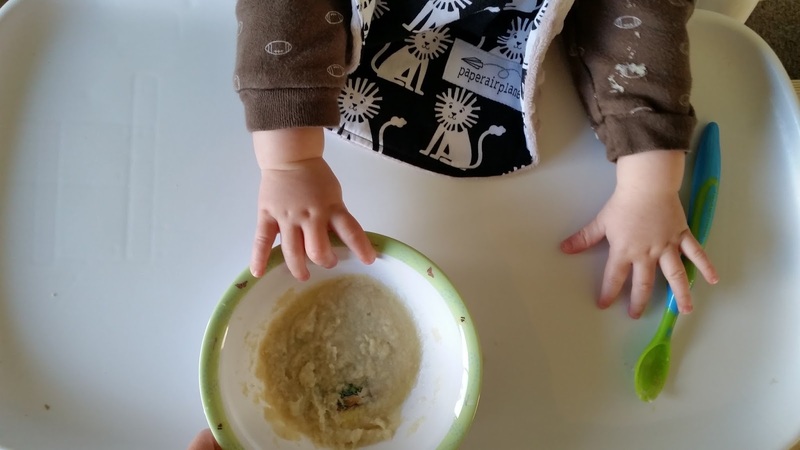 When your family is eating together, give your baby the same foods in a form they can eat. Eating the same foods as you will help your baby learn healthy eating habits with the rest of the family (with Ari I liked giving her foods that still had a little bit of texture, such as broccoli mashed with potatoes, so she didn’t only have purees, but you still have to watch out for lumps/ big pieces). There are some great baby food options available (click here for some ideas) and your baby can easily enjoy the same nutritious food your family does. It’s also good to think about your own behaviour when it comes to food: your baby may notice and mimic your behaviour with foods you don’t enjoy. With busy days, it can be tough to unplug and focus on your meal and disconnect from electronic devices. But to set a good example, it’s best to limit distractions. Try to put aside 15- 30 minutes for you and your family to focus on your meal. This will teach your baby that meal time is important; and as your kids grow, this can become an important time to connect with them. And it’s worth noting that families that eat together, eat healthier. At around six months of age, the iron stores that babies are born with begin to decline and they need iron-rich foods to meet the nutrient needs of their fast growing bodies. Try boiled or well cooked meats and fish, iron-fortified infant cereals (I like rice and grain cereals; try PC® Organics Rice Cereal with Banana), tofu, beans and legumes, and cooked egg yolks. Tip: Serve iron-rich foods with fruits and vegetables that contain Vitamin C to help your baby absorb the iron. Plain veggies can get a little boring, so you can add flavour using herbs and spices that are mild enough for a baby’s palette. While additions like salt add unhealthy sodium, fresh or dried herbs and spices will introduce them to flavours in new and interesting ways. For an interesting twist, try adding cinnamon to PC® Organics Strained Sweet Potato & Chicken. During meal time, let your baby try sipping water from a lidless cup. With a little patience and practice, they’ll be drinking from a cup alone in no time. 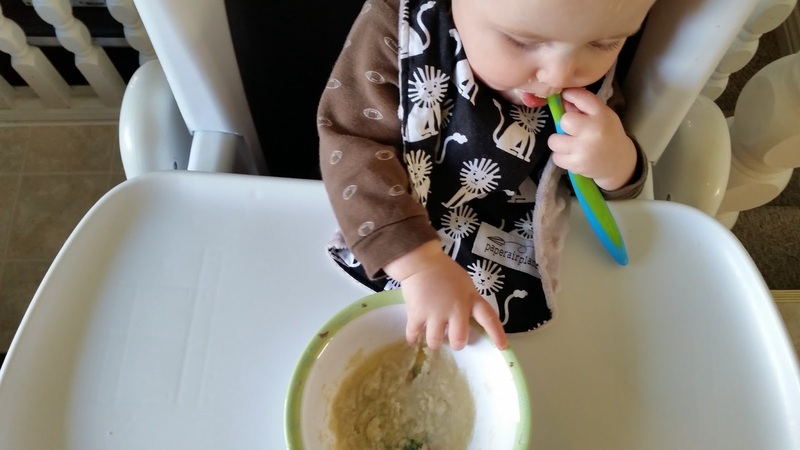 Once your baby starts solids, it can become one more thing to have to think about. If you’re planning a play date or outing, get their food bag ready ahead of time and stock it with everything you need: spoon, cup or bottle, bib, and the food you want to give them. One thing I am so grateful for is the food pouches that are now available. I stock up on a variety at once and you can either squeeze them onto a spoon or let your little one hold them. 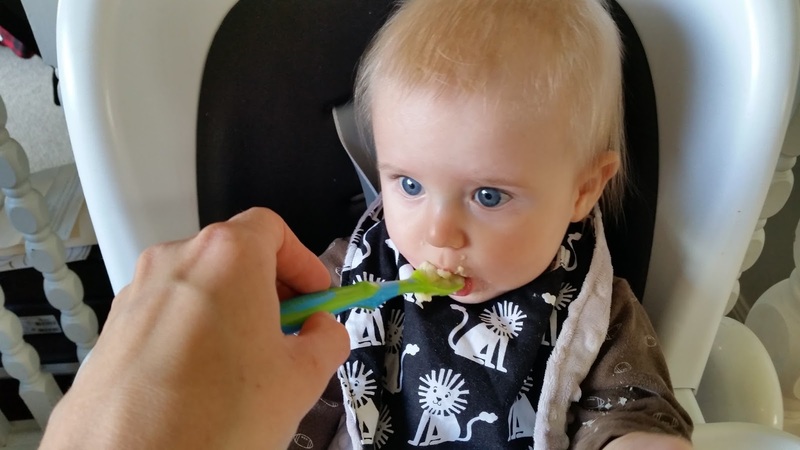 They make feeding on the go much easier and less messy. Plus they’re a great option when your kids are a little older and can feed themselves. Having fun trying out solids with my little guy! Visit the PC® Organics website to learn more about their products. Stay tuned for more content with PC® Organics in the coming months.